Canned Beer Month Kick-off Party! This show is not to be missed!! 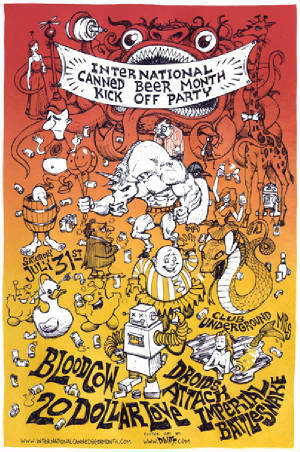 4 bands from around the midwest converge to celebrate the arrival of the 9th annual International Canned Beer Month! . The poster will go on sale here in my website on Aug 2nd, or you can come to the show and pick it up at a reduced cost (and you should come to the show anyway because its going to explode your senses)! On sale now (or soon)! Greetings everyone! My Silversun Pickups poster is now on sale. Get your copy HERE! 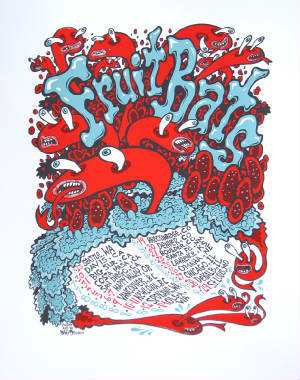 And on August 2nd, my new tour poster for Fruit Bats will go on sale. One full year of EVERYTHING I print. For all the details go HERE and please contact me if you're interested and let me know how you'd like to pay, as well as what edition number you would like. I have come out from underneath the huge task of drawing/printing/assembling/ and mailing my wedding invitatons (with a HUGE help from my fiance. xoxo Nikki!). Posters will be pouring out of me for the rest of the month! Coming up is a Fruit Bats tour poster, this year's International Canned Beer Month kick off party, Rogue Valley's summer CD release show, and a flyer for Zombie Pub Crawl 6. 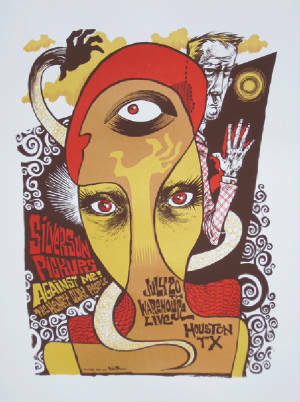 The first off the printing table is for Silversun Pickups in Houston, Tx. Also coming soon is a t-shirt design for Bad Religion, and the next print iny my Last Words series. Stay Tuned!